The new profile configuration’s copy function offers you more security in construction of curtain wall positions. You can copy curtain wall profile configuration, sleeves, material packages and supports, as well as splices, extensions, profile properties and free editing fast and reliably. 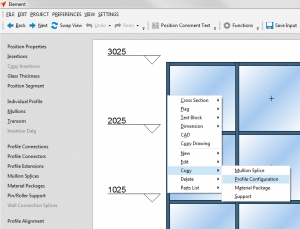 To copy profile configurations right-click a curtain wall profile. Select in the context menu under “Copy” the option “Profile Configuration”. To insert the profile configuration, right-click another curtain wall profile. Select under “Insert” the option “Profile Configuration”. A special highlight: While working with several screens at the same time, the profile configuration will be copied cross-positioned. Under „Edit“ in the file menu, you will find the feature „Copy Profile Configuration“. This feature lets you transfer profile configurations to several mullions or transoms via a selection box or Ctrl + Click at the same time.